Hungary PM Viktor Orban addressed Fidesz supporters in the Romanian spa town of Baile Tusnad on Saturday. In a speech to Fidesz supporters in Romania on Saturday, Hungarian Prime Minister Viktor Orban said “the era of liberal democracies is over”, and announced the formation of a parliamentary committee for the continuous monitoring of “foreigners who try to gain influence in Hungary”. 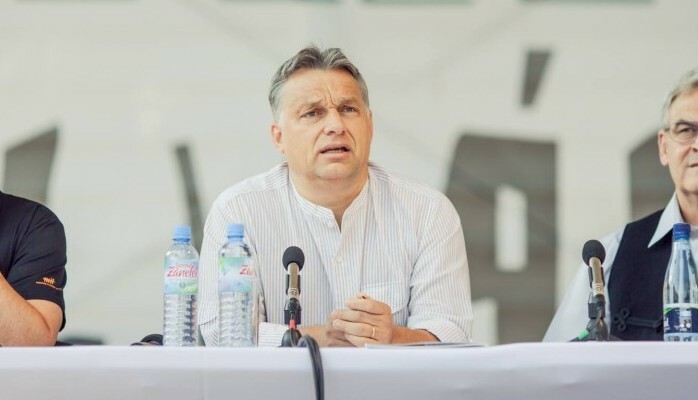 “We are setting up a sort of a spiritual Iron Dome system, that is not to be breached by anyone,” Orbán told the crowd at Fidesz’s annual Hungarian Youth Free University at the Carpathian resort town of Baile Tusnad (Tusnádfürdő). Not only foreigners are in Orbán’s sights but also Hungarian NGOs and their employees, specifically beneficiaries of European Economic Area and Norwegian NGO funds that have been the subject of pro-government media smear campaigns and politically motivated audits conducted by the Government Control Office (KEHI). “Some NGO workers who often appear in public are foreign-paid political activists, who are promoting foreign interests,” he said. Saturday was the first time Orbán had publicly addressed the months-old dispute between the Prime Minister’s Office, led by Chancellor János Lázár, and the Hungarian administrators of the EEA and Norway Grants, which represent the contribution of the non-EU Iceland, Liechtenstein and Norway to the EU’s 16 newest members, including Hungary. The funding bodies have continued to provide grants to civil organizations in Hungary, some of them critical of the Fidesz-KDNP government, despite having officially suspended payments of development grants to the Hungarian state. This has prompted a series of attacks on the Funds, the donor countries, and the NGOs they sponsor, led by Orbán’s trusted enforcer Lázár and his state undersecretary Nándor Csepréghy. On hearing Orbán’s denouncement of the foreign funding of Hungary’s civil sector, some commentators noted that the Fidesz chairman himself had been the recipient of a Soros scholarship in 1989. However the PM was referring in all but name to Marton Gulyás, artistic director of the theatre company Krétakör, which has co-organised numerous anti-government demonstrations. With a mission statement to reflect contemporary social and political issues, Krétakör has highlighted the government crackdown on Hungary’s civil society and its remaining independent mainstream media since April’s general election, when new election laws saw Fidesz retain its two-thirds parliamentary majority, despite losing some 700,000 voters. He dismissed the US approach of seeing the spreading of human rights as a principal duty. “Definite, pragmatic and relation-centered” diplomacy should be promoted over “enumerating human rights,” he said. The objective of a “truly national foreign policy” is to make every global player interested “in the country’s success”. Earlier this month Orbán opposed EU sanctions on Russia over its invasion of Ukraine hours before the Malaysian Airlines flight MH17 was shot down – seemingly by Russian-backed Ukrainian separatists using a Russian-supplied missile launcher – killing 298 people. However he remained unapologetic about realigning Hungary with Russia and borrowing EUR 10 billion to extend the Paks nuclear power station. “The presumption that we will fall into the arms of the Russian bear is pure fear-mongering. We are NATO and EU members,” he underlined. However Orbán added that Hungary’s “greatest current problem” is that an “unhealthy” amount of trade is conducted with the EU. A 50-50 share of trade with the East and West would be the “healthy proportion”, according to Orbán. “What is happening right now regarding Russia’s relations to the West is really bad for Hungary,” he conceded, adding that “it would be in our interests for Russia not to break off from Western social development”. He called the global economic crisis of 2008 a “watershed in European history, comparable only to 1945 or 1990. The welfare state and society have exhausted their reserves. Nowadays, it consumes itself with indebtedness and this is no longer a sustainable form of existence in the West. It is not worth following this unsustainable model. Copying Western models is a kind of provincialism that will kill us,” he argued. Acknowledging the many ethnic Hungarians present, Orbán said the 2014 national elections had “restored moral order” and been “just deserts” for those who voted against dual citizenship in the 2004 referendum. He reasoned that Hungarian votes from abroad had tipped the balance in favor of Fidesz retaining its two-thirds constitutional majority. This new Hungary “will be a new labor state that will respect Christianity, freedom and human rights”. The era of liberal democracies is over, Orbán added, and listed China, India, Russia, Turkey and Singapore as countries that could offer Hungary inspiration. “Our time will come,” he concluded.